This tutorial will outline how to extend the WordPress administration screens for your post types by customizing what columns of information are displayed. We will start by outlining how WordPress displays your post type listings by default and what information is shown to your users. We will then move onto what hooks will be required and how we will manipulate the columns that are show for your post type. Finally we will pull in additional meta data for our posts and display that information in our columns. By the end you should be able to extend and modify the administration screens for your post type, allowing you to show additional information and actions for your users. When you create your own post types (or use the default post types such as ‘posts’ and ‘pages’), WordPress will create an administrative area that you can manage your posts from. This area is generally accessed from the backend of your website via the main administration menu. 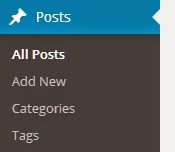 In the image above, we can either select the ‘Posts’ administration menu or its sub-menu ‘All Posts’. Selecting either one of these options will bring you to the posts administration screen shown below. This administration screen will outline all of the posts for your post type. In this example it will display all of your blog posts, but it could easily display your ‘pages’ or any custom post types you have defined. Now that you know what the posts management is, we can now work on enhancing this interface to provide additional functionality. The main reason you will want to extend these interfaces is to provide additional actions and information to your end users. If you have expanded the default WordPress post types to include additional meta information (or you have defined entirely new post types), often you will want to show this information to the user directly from this management area. We are going to show you how you can enhance these post management interfaces by customizing and populating post columns. To customize the way in information is displayed you will need to use two filters, one to determine the columns that will be shown for your post type and another to populate your column data. To customize your content type you will need to use the manage_$post_type_posts_columns filter. For our example we will be using the manage_page_posts_columns filter to determine what columns are displayed for our page post type. This filter takes in a single parameters called $columns which is an associative array of column names and its displayed title. This variable is what you will be interacting with. Now that you have access to the $columns array you can either add new columns to your post type, remove columns or even alter the position in which they are displayed. For our example we will be removing a few columns and adding our new ones. This function will first remove the date, comments and author columns using the unset() function (which removes / destroys variables). 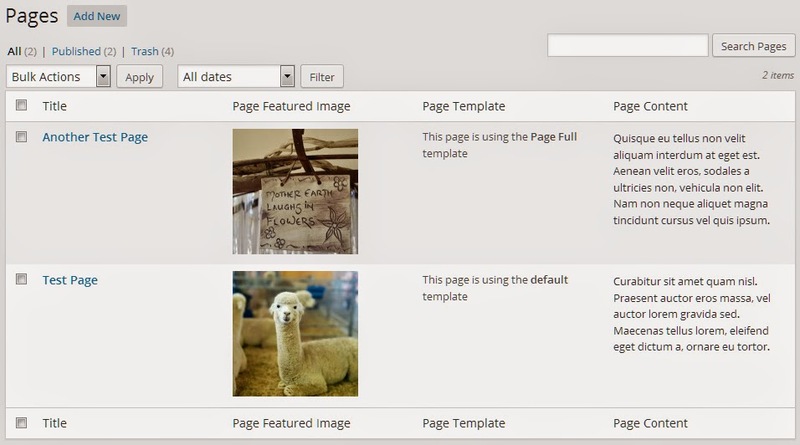 Secondly, the function will add three new columns called page_featured_image, page_template and page_content. Now that you have determined what columns will be shown for your post type, you will need to hook into another filter so you can populate your columns. Themanage_$post_type_posts_custom_column filter will be used for this purpose. For our tutorial we will be populating the columns for our page post type so we will be calling the manage_page_posts_custom_column filter. This filter takes in two parameter, $column and $post_id. With these variables we are able to determine what column is being customized (since it will loop through all columns set in the $columns array) and also what the ID of the post is (so we can use WordPress functions given that we know what post we want to pull data from). We will call a function, passing in those variables and then look for our newly created columns. When we find the column we are looking for we will collect our data and then output it for display. For our featured image column we are checking to see if the page has a featured image (post thumbnail) set. We call has_post_thumbnail() and pass in our $post_id variable which returns either true or false depending on if a featured image has been set for this page. If we do have a featured image we call the get_the_post_thumbnail() function, passing in our $post_id variable and the size we want thumbnail. We will then echo this image item out and it will appear inside our column. For our page template column we first get the current page template being used by the page by looking at its _wp_page_template meta data. This key holds the filename of what template will be served when displaying the page. We check to see if the page template for this page exists in the listing of all page templates. If it doesn’t it means that it is using the default template (meaning it will be displaying page.php). For our page content column we call the get_post() function, passing in our $post_id variable. This function will retrieve the page belonging to this ID. If we found a page we then collect the pages content into a variable by using the apply_filters function. We pass into this filter the value of the_contentand also the page content pulled from the $page variable (post object). Once collected we display it. Below is an example of how your page administration screen could given your new columns. Now that you know how to extend your pages administration screen with customized columns, you can go through all of your post types and customize the exact data you want shown for your post. Being able to customize what data you display to your users will be highly useful for custom post types as you can bring in whatever information you need given that you have access to each post’s ID (and thus all of its meta data). You may even want to add additional actions into these columns, such as dynamically updating content or selecting new media, this is all possible with customized columns.